Your ultimate goal in pursuit of a car audio system is a believable rendition of the live performance. The CDT Image is created by strategic driver positioning coordinated with optimal crossover frequencies and characteristics. StageFront creates a significant improvement in musicality and the "fun factor" of car audio that is immediately apparent. It is not too difficult to install, is not too expensive and sets a new standard for reverberant field musical transportation. Once installed you can see the speakers mounted in their usual location - in the bottom of the left and right door panels but the sound will not seem to be coming from down low where the speakers are at all. It will appear in front of you - much like the musical presentation you get at a live concert. This goes far beyond what's usually accomplished by adding a set of A-pillar mounted Tweeters to augment the sound. Hear one of the most immediate and ear-opening experiences you’ve ever had. Until you've heard CDT Audio, we think you've never heard the most accurate, most compelling musical reproduction you can hear in a car. Our ultimate goal in pursuit of a car audio system is a believable rendition of the live performance. The special perspective of an automotive environment and the fact that the vast majority of recordings were electronically mixed from a variety of tracks makes us realize the goal is really to produce a credible illusion from an exciting perspective. The smaller enclosed volume in a car will always differentiate auto-sound from home audio and likewise home audio from theater sound. The larger the listening venue, the longer are the reverberation times. The close-up environment of auto-sound naturally results in a more intimate sound somewhat like headphones. This is a different perspective from which and in which we experience the performance. Within these parameters our goals include clarity, focus and ambiance. Stunning results are possible. Your subjective judgment is all that’s required to know we have arrived. This is a rare experience in the real world. Crossover networks use filters in high pass, low pass pairs. These may be symmetric or asymmetric and may (usually significantly) involve driver characteristics, which affect slope, and shape of the roll-off at both the upper and lower ends. Many filter variations for which no particular name has been applied also exist and may be employed. The elliptic filter for instance differs from most others in having transmission "zeros" in the stop band. These are frequency nulls where the sound virtually disappears. CDT also uses symmetric and asymmetric filters in combinations in various products. The strategic and selective use of these crossover filters in the automotive environment with specially positioned drivers implements StageFront and other CDT design solutions. Enabling the smooth integration provided by these crossover techniques are special selected driver technologies. 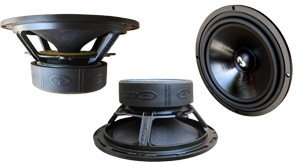 CDT mid-woofers and woofers employ cast baskets, curvilinear cones and select dust-caps to integrally produce a smooth response out beyond each upper crossover frequency. The best material constructions for each design are selected from fiberglass weaves, carbon fiber and special polymers. Putting together all these techniques provides you with the CDT Audio sound. CDT creates a more intimate sound with spectacular resolution.